The Lawrence Community Theatre ghost photo taken in 1987. Even the most hardened of cynics, when roaming the halls of the purportedly haunted Lawrence Community Theatre in the dead of night with all of the lights turned off, will be forced to admit that it can be really creepy. Creaks, groans and weird props lurk around every corner of this large and drafty theater. Whether this half-century-old building is actually infested with ghosts, however, is still up for debate. As far as the theater staff is concerned, that debate is good publicity for their upcoming production of the supernatural comedy “Blithe Spirit.” As one of those hardened cynics who wants to see whether there’s anything to this metaphysical mumbo jumbo, I’m happy to oblige in that publicity. The ominous-looking structure at 1501 N.H. began its life in the ’50s as a church for Full Gospel Christian Assembly, only adding to the spiritual reputation of the site. LCT purchased the building in 1984 when the church dissolved after a rift in the assembly. 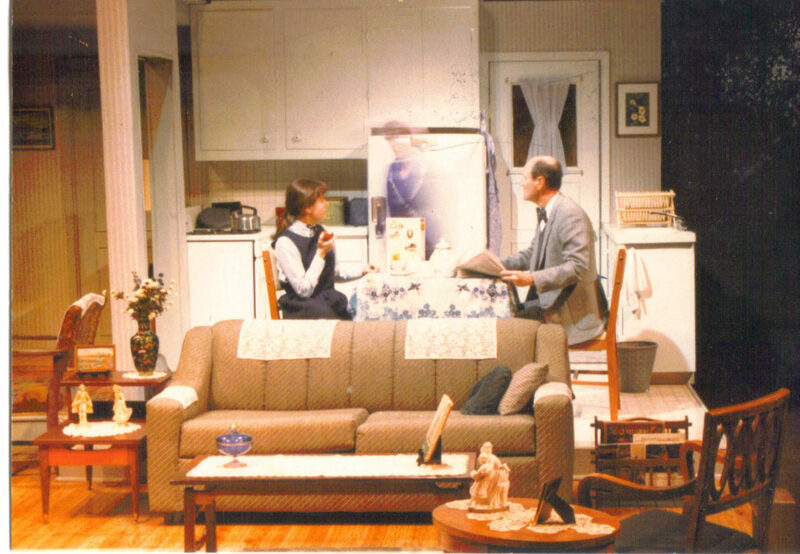 In 1987, during a dress rehearsal for the spy drama “Pack of Lies,” a photo was snapped that would cement the theater as one of Lawrence’s premier spectral hot spots. The photo clearly shows the translucent figure of a woman standing between two actors, a woman not fitting the description of anyone in the venue at the time. The photographer, Jack Riegle, insists that the image has not been intentionally altered, pointing out it was taken well before the era of Photoshop. That incident seemed to kick off a series of unexplainable encounters over the next 23 years at LCT. Casts and crews have reported everything from feeling cold spots to sensing a vague presence in the room with them. One actress even claims to have been shoved down a flight of stairs by someone who wasn’t physically there. All of this has made the theater a target for ghost hunters and a frequent entry for online haunted house registries. One such entity interested the theater’s past is the Wichita Paranormal Research Society. This group of amateur-apparition sleuths has been investigating the Midwest’s most haunted locales for nearly five years. They’ve repeatedly requested a chance to monitor LCT over those five years but have been politely rejected until “Blithe Spirit” (which opens April 15) offered Doveton an opportunity to capitalize on the offer. I decided to tag along with Wichita researchers during their recent investigation. 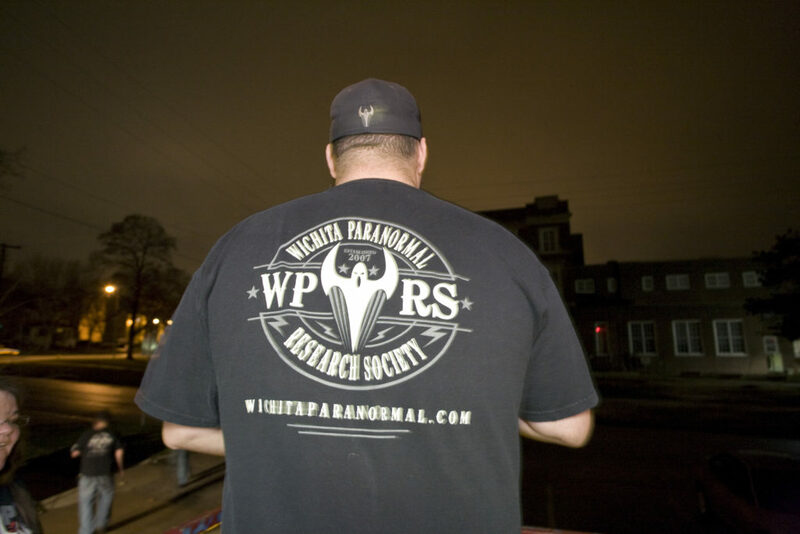 Shane Elliott, founder of the Wichita Paranormal Research Society, wearing a WPRS T-shirt, stands outside the theater. Rather than wild-eyed crackpots or reality television-style media hounds, the group was surprisingly skeptical and upfront about its chances of finding an honest-to-goodness spook. “Only in about 10-15 percent of our investigations do we find something that we cannot explain,” says Shane Elliott, worker in the Wichita aircraft industry by day, team captain of Wichita Paranormal Research Society by night and weekend. Elliott became interested in the paranormal after an incident five years ago involving a strange humming sound on his son’s baby monitor and what may or may not have been an encounter with his deceased grandmother. “I think we all started out looking for answers to our own personal experiences, but that really only gets you so far,” says Elliott, who fully admits that most so-called supernatural incidents have very natural explanations, such as electromagnetic field (EMF) interference with electronics and the habit of the human mind to see patterns and familiarity where there is none (the team calls this “matrixing”). The WPRS's tools of the trade. 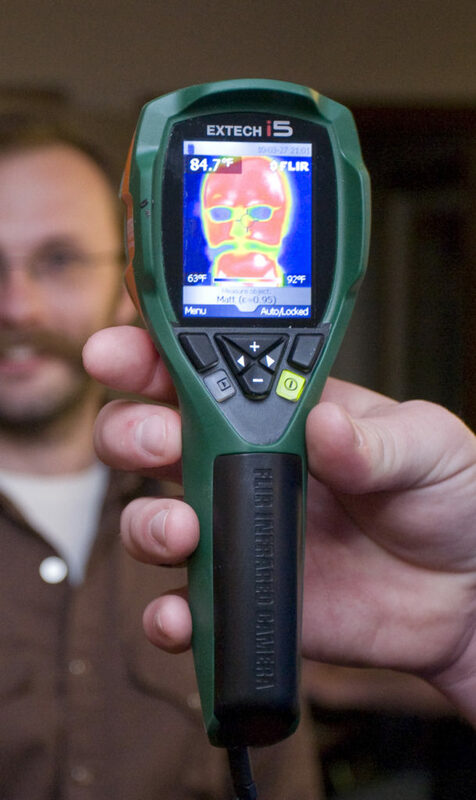 The WPRS's heat sensing device. Elliott and his four co-horts unloaded an impressive array of equipment into LCT that dark and stormy night (no, seriously Š it was overcast and pretty eerie). 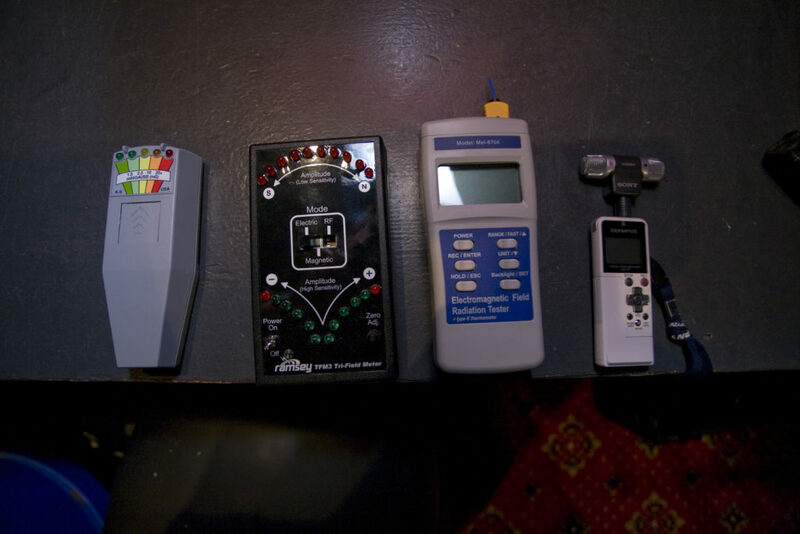 A monitor displays the feeds from various cameras that the WPRS has wired up throughout the Lawrence Community Theatre. Once the cameras and monitors were set up in each of the theater’s “hot spots,” where activity of some sort has been reported in the past, all of the lights in the building were turned off, and the group split off into two-person teams. Then the waiting around in the dark began. The routine would generally go something like this for an hour in each hot spot: The two investigators would sit in silence, ask a question into the dark (along the lines of “Is anybody there?” or “Would you like to say something?” or “Would you like to tell us about the afterlife?”), sit in silence some more, get excited about a spike in one of the EMF detectors, realize it was probably someone’s cell phone setting it off, repeat. It all felt like a high school slumber party when someone whips out the Ouija board and you’re all trying to freak each other out. Even though nothing should logically frighten you, there’s an almost willing suspension of disbelief. It was fun to get the hackles raised on the back of your neck. Same principle as a horror movie or an amusement park ride, even though most of it was sitting in silence and snacking on a platter of sandwiches. This went on for about five hours. Despite a random EMF spike that couldn’t be explained and some whispering voices which couldn’t immediately be dismissed as echoes through the air ducts, the team didn’t come up with anything concrete that night. That’s typical, they tell me. 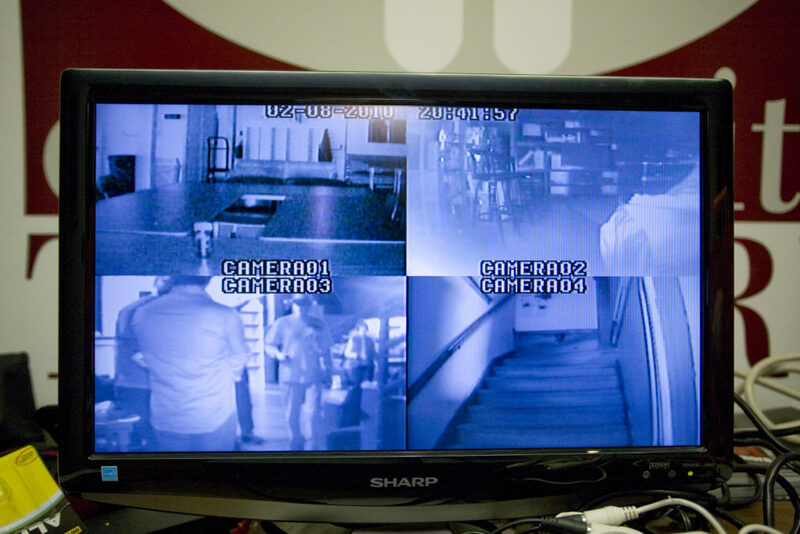 It usually takes upward of two weeks to comb through all of the video and audio they recorded during an investigation. The devil, so to speak, is in the hours and hours of data they compile. Maybe a sourceless orb of light will appear in a few frames of video or a voice directly answering a question will be unscrambled from audio white noise. In the meantime, while we wait for proof (or the lack thereof) from the Wichita Paranormal Research Society, the proprietors of LCT want everyone to know that the play is the thing, and the supposed “ghost” is but a player.